While the protests evolved into a full-scale demonstration against Prime Minister Tayyip Erdogan (more on that later), they started out much smaller. The peaceful sit-in began on Monday to counter planned construction at the park, which would replace one of downtown Istanbul’s few green spaces with a shopping mall. The scene looks similar to what cities like New York and D.C. experienced during the Occupy protests: large crowds of people milling around, playing instruments and sleeping in tents. But on Wednesday, Erdogan said the construction would continue “no matter what they do.” And this morning, AP reports, police staged a dawn raid of the encampment to get the protesters out. Tweets and photos from the park appear to show people, including children, sheltering from tear gas in nearby subway stations. Several images show police shooting tear gas at protesters from feet away while protesters cowered behind their own signs. In this video, which appears to have been taken from a building on Taksim Square, police can be seen firing water cannons at protesters running across the park. Taksim Square is, notably, a loaded place for the Turkish left. In 1977, dozens of protesters were killed in the square when unidentified gunmen opened fire on May Day celebrations. 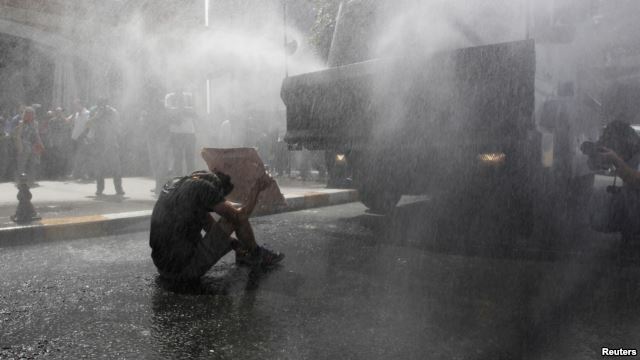 In 2007, police detained nearly 600 after a violent rally in which protesters chanted for Erdogan to resign. And riots broke out again on May Day this year, when hundreds gathered for an anti-government demonstration despite a government ban. The repeated crackdowns, and a growing perception that Erdogan’s government has displayed what the AP calls “increasingly authoritarian and uncompromising tendencies,” have motivated some to call for more mass action. Istanbul’s Hurriyet Daily News reported on Wednesday that Turkey’s main opposition party leader, Kemal Kılıçdaroğlu, visited Gezi Party and promised protesters that a member of his party would be there every day, supporting them. Protesters reportedly held a sign that depicted Erdogan as an Ottoman sultan. Erdogan, who has been in power since 2003, is both Turkey’s most popular politician and, in the words of the Hurriyet Daily News, “one of the strongest Turkish prime ministers ever.” The protests would have to grow considerably to challenge him: Erdogan has signaled that he plans to run for the presidency when his term expires, and while he isn’t the frontrunner, he’s consistently scored well in approval polls, even winning the people’s choice award for Time’s 2011 Person of the Year.